Recently fell in love with Young House Love. 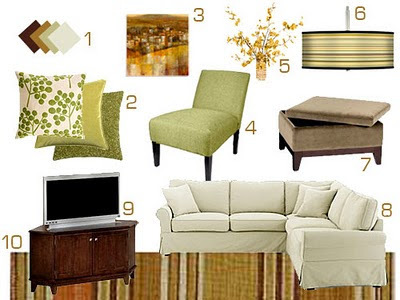 Apparently this is a mood board designed for someone's living room makeover but it might as well be mine. Mine. The green chair (love it), the sectional (also, in love). The pillows, the paint, the ottoman (in deep smit, I tell you). PostScript - Young House Love is #12 on the Times Online UK's 50 Best Design Blogs list. Cool, eh? Other favorites are Chez Larsson, Making It Lovely, Oh Hello Friend, Decor8, Desire to Inspire and, of course #1 Apartment Therapy. Apparently I've got my little finger on the little pulse of a little corner of the design scene. Not too shabby if I do say so myself. And well, I do.